I think one of the biggest challenges that a teacher faces when they are reflecting and analyzing their teaching is to distinguish between things they can control and things they can't. In the past, when things slipped out of my control, I responded by tightening my grip. Kids talking more than I would like? Punish any talking! Kids walking around the class? EVERYONE MUST STAY IN THEIR SEATS!! The more I talk to teachers and more I actually think about it, the more backwards this seems. Yes, students need structure. Yes, students need rules. But it's almost always a mistake to do group punishment. In many schools around the country there is no recess, or even really down-time for the students. They have shortened lunch periods and, during lunch, the students are required to stay in their seats. While this may seem harsh, this decision was made for very well-intentioned reasons. It was found that lunches went very well for the first 30 minutes. Then, once all of the students had finished eating and began walking around, that's when all the fights happened. So the lunch periods were shortened and movement restrictions were put in place. As a result of this, students have less time to burn off their nervous energy and socialize. That time gets moved into the classroom with students acting up and bouncing off the walls. So the school institutes stricter policies for behavior, clamping down tighter causing more nervous energy to unleashed in inappropriate places. This cycle spirals out of control until the school is either shut down or drastically changes its mindset on student downtime. 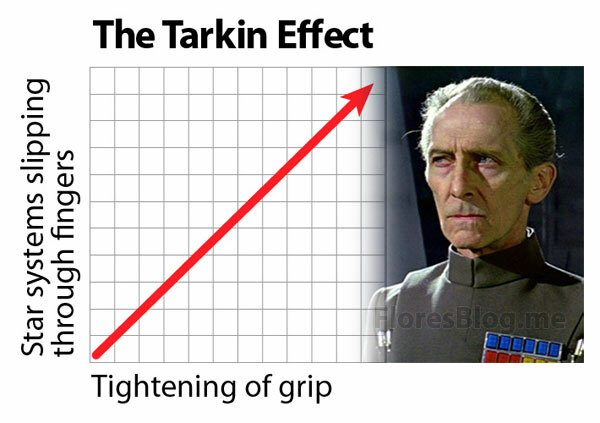 I call this The Educational Tarkin Effect. At the same time, completely letting go of restrictions is equally as disastrous. Students need to learn to be responsible and the school must provide a safe place for them to learn those skills. In any event, the geometry kids are getting squirrelly and I don't know how much of it is under my control. I've been trying to cover more curriculum content with them after the complaints I received last week. I want them to learn math, but apparently, if I don't at least throw in calculation, they think I'm not teaching them. I want them to be able to distinguish between "doing math" and "doing calculation" but that's a long hard road and I have to backtrack to lecture occasionally to make them feel ok about what we're doing. I did manage to intersperse a good tale of applied geometry from this weekend. I went with my family to a Maple Festival yesterday where I met a cooper. I talked with him for 10 minutes about the math of how he makes his barrels and buckets and got some great information to bring back to my students, along with two spectacular pictures for them. They were highly engaged and we had a nice talk about the process of barrel making and the mathematics involved. I wonder if I can find a cooper to come to the school and demonstrate either in class or in the woodshop. It's something to look into. Half of my period 4/5 was meeting with Wes Lyons today for the first half of class. The kids who remained got some great momentum going as we worked through percentages and weren't derailed by the addition of the rest of the class. Wes joined the class for a bit and we did an impromptu Estimation 180 to guess his height. I'll never forgive myself for not getting a picture standing next to him. He's 6 feet 8 inches tall. That's not me, but that's about the height difference. He sat with me and a student as I helped her through the concept of converting percentages. He was very encouraging to her and I was glad he joined us. In period 8/9 however, without about 20 minutes left in class, I got tired of being talked over, having the same kids ask the same questions because they weren't listening, telling the same kids to stop talking and having them take an attitude with me, claiming they weren't doing anything. I gave them their assignment and put myself in time out. Sometimes I just need a time out. That last part about giving yourself timeout ... my friend here at school calls that "punting" and it's something I definitely need to get better at doing. I'm used to never ceding control of the class for an instant. But he tells me, sometimes you've just got to throw control over to them while you take some time to get your stuff together. You can't be ready to go all the time. The self-time-out is another good take on it. Anyway, the real purpose of my visit is to share with you some Pharell lyrics I'm working on. It gets a little off-topic at the end ... And it's not really covering what we're talking about in my Pre-Algebra class, and that's the class of mine that most needs to do this song-making activity, so I don't know if I'm going to use any of it myself. But I definitely wanted to share.